Philip says that the location is Longsight MPD 'Old', or 'South', Shed in March 1934. In view are ex-Midland 0-4-4Ts Nos. 1278 and 1274. The mystery is - why were these not-too-powerful ex-Midland locos assigned to Longsight, and what services might they have worked? I asked Mike Bentley about Mystery 101 and the following information has come from him. The Midland 0-4-4T engines at Longsight shed had two jobs: the Stockport-Stalybridge locals, which had been a Longsight turn before the opening of Stockport Edgeley shed and remained so after it; and the Styal line push-and-pull trains, on which they were sandwiched between the carriages. When the class was introduced, some of them were sent to Buxton for working the Buxton-Millers Dale trains. No. 1278, seen in this picture, was sent to Longisight from Buxton and eventually returned there. As BR no. 58042 it was the last engine at Buxton to have Salter safety valves. At Longsight the Midland engines were replaced by Stanier 0-4-4Ts nos. 6405-6, which later became nos. 1905-6, and 1908 joined them there later. The chimney above the shed on the right-hand side is that of the foreman's office. During the war, the roof over the four roads on the right-hand side, nos. 9-12, was damaged in a German air raid. What was left of the roof was dismantled, and the roads remained open to the elements. After the war, the rest of the roof was rebuilt in the then modern style. The only pull+push service that comes to mind is that from Manchester London Road to Warrington Bank Quay and Ditton via Broadheath and Latchford. From the Grouping these ex-MR tank locomotives would be available to take over this service from the LNWR �Chopper� 2-4-2Ts. The MR �1532� 1P 0-4-4T engines were built from 1881 onwards. No. 1274 was scrapped in 1937 but no. 1278 was not disposed of until 1952 from Buxton (9D), BR no. 58042. Other types of loco that were available were the Stanier/Johnson 2P 0-4-4Ts from 1934. Nos. 1908 and 1909 were fitted for pull+push operations. No. 1908 (41908) was at Longsight (9A) from 1948 until withdrawn in1959. The Ivatt 2P 2-6-2Ts were the last type of loco on the above service in 1962 when the passenger service was withdrawn. I don't ever recall seeing a Midland 0-4-4T on the Ditton/Bank Quay/London Rd. trains. Most trains were three coach sets hauled by Watford tanks. Push-pulls were in the minority still 2-4-2T powered until the 2-6-2 Stanier tanks arrived. Just re-reading Steam Days for February 2004, featuring Longsight on pages 70-90, on page 82 it says, "Ex-Midland Railway 0-4-4Ts came to Longsight in 1932 and were motor-fitted to work push-pull trains over the Styal line." I agree with Mike Bentley and Mike Morris. Ex-MR tanks 1274, 1276 and 1278 were allocated to Longsight from August 1932 to Jan 1937 in replacement for 5'6" tanks 6661, 6667 and 6743. They were VCR-fitted to work the Styal line motor service but this was just a single diagram. No doubt the Stockport - Stalybridge locals were on a separate one or two diagrams, worked by the same engines as mentioned by Mike B. The question that still needs to be answered is precisely why these engines were chosen to be sent to Longsight for these duties. From 1937 to 1940 there were still ex-MR tanks at Longsight, but not the same ones. from 1938 to 1940 they were 1278, 1286 and 1416. I'm not sure of the reference to 6405-6; at what date are they supposed to have gone to Longsight? After the War? Were they VCR-fitted? 41908 was VCR-fitted and in the 1930s was at Watford for the St Albans motor trains, and did indeed end up at Longsight from 1948 to 1959. Reference to the Manchester - Broadheath - Warrington - Ditton motor service is a red herring, as is that to 2-4-2Ts and Stanier 2-6-2Ts. In fact the ex-MR 0—4—4T nos. 1249 and 1273 to 1278 were all fitted with VCR apparatus by the LMS in 1927. Some or all of these were done under Derby Order 6871. At this time there were very few, if any, motor services on the Midland Division and most of these engines were sent to the Western Division where they worked from Bushbury and Walsall by October 1928. 1239, 1246, 1252/3 and 1260 were fitted at the same time, or soon afterwards, and some of these worked at Rhyl by 1930. Most of these went back to the W Division within a few years, but three went to Longsight in 1932. I don't have copies of any relevant minutes of the LMS Traffic Committee, or Loco, Carriage & Wagon Committee, but there must have been a decision to use these ex-MR locomotives to supplement the ex-LNWR locos on the W Division services. 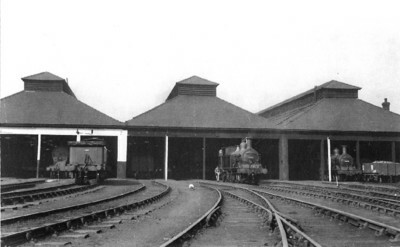 This was the time at which the LMS was revising its whole motor train operation (from 1926 onwards) by converting the LNWR services from rodding to VCR operation, the L&YR services from compressed air to VCR operation, the withdrawal of the rodding-fitted 4‘6“ tanks and their replacement with VCR-fitted coal tanks and 5‘6“ tanks as well as the ex-MR 0-4-4Ts. It was only a bit later, in 1931-34, that many motor services were instituted on the Midland Division. By this time the Western Division changeover was largely complete. The relevant minutes and reports would make interesting reading.